I am a 6th grade Social Studies teacher in Franklin, TN. I LOVE MY JOB! 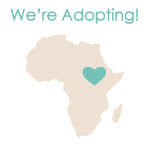 I started this blog with a dual purpose: to document the process of the adoption of our first child from Ethiopia and to document the transformation of our first "nest." This blog is a random collection of thoughts about adoption and my secret passion (well, not anymore) for interior design. I hope you enjoy my collection of things that I find simply pretty and inspiring!